Adam of The Metropolis Times and I are fellow blogspiriter. I’ve long enjoyed his blogs, and have recently commented favorably on his presentation of an ACLU civil rights video. Likewise, his recent post on Atheist Activist tied into my decrying of secularist destruction of war memorials..
His most recent post caused me to write a comment that rapidly became post-length. So I am presenting it here instead of its original home in his multiculturalism thread. I cannot emphasize how wrong it is. The belief that Multiculturalism — which is essentially a profession of rights of collectives or third-generation human rights is anything like traditional human rights is dangerous naive. Not “wrong” as such, but fundamentally misinformed. It is a dangerous misunderstanding of an actual movement. Adam says, “I’ve only met one person in my entire life who seemed to believe that, my freshman Cultural Anthropology professor. While this sort of radical existentialism…” There is nothing radically existential about the belief. Modern multiculturalism traces its intellectual foundation to Emil Durkheim. It describes culture as a superorganism that exists essentially independent of the people who compose it. Durkehim wrote that “Omni cultura ex cultura” that all social effects are entirely created by social causes. In other words, a culture is in no way intelliglbe from the perspective of its members. That NO individual level of analysis is IN ANY WAY meaningful to society. To emphaize; a Durkheimist would say “Something happens because individuals want….” is meaningless. From Durkheim’s cleaving of Man and Society, one now approaches how to judge cultures. But what standard should one use? The human body is like a super-organism to the cells that contain it, but what sane humanist would judge a man by the well-being of his cells. Indeed, what is well-being? A cell that doesn’t die may be all well and good for itself, but it is a cancer to the Man. In the same way, judging a culture by the way it treats individuals is meaningless. At this point, most multiculturalists do for Culture what the northern enlightenment thinkers did for Man — declare them fundamentally equal. What most so-called evil multiculturalists actually believe is that individual rights and liberties are universal to all cultures and peoples of the world, equally. is thus the reverse of what multiculturalists actually believe. Indeed, Adam is defining multiculturalism as a type of monoculturalism — a belief that there exists one and only one set of “individual rights and liberties [that are] universal”. Likewise incorrect is Adam’s claim that this multiculturalism has not done much harm, or as he says multiculturalism has “hardly taken hold of any significant part of American society.” If I had needed any more proof that this was incorrect, I got it from my readings in evolutionary politics. Scientists have been denounced, had research banned, and received death threats from campus multiculturalists enraged by evolution’s implication of a Universal Human Nature (with its implication of a Universal Human Metaculture). Multiculturalism is an illiberal belief in the fundamental equality of cultures. It is an inhuman, destructive creed that is powerful in certain niches such as academia. 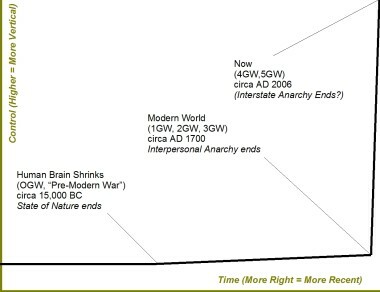 Complexity Rising: From Human Beings to Human Civilizations, A Complexity Profile,” by Yaneer Bar-Yam, NECSI Research Projects, http://necsi.org/projects/yaneer/Civilization.html. Why? Because the history of human civilization has been the history of steadily increasing vertical control. 17,000 years ago, when the human brain began shrinking, man became a social animal and the State of Nature was overturned. The parts of the human brain that were lost deal with the ability to navigate pure network structures — aggression and weariness. The success of the verticalization of human affairs took another step forward with the foundation of the Modern State and national police forces. A work still incomplete in many parts of the world, including Iraq, the Modern State has led to a hundred-fold decrease in murder of the past few centuries. a worldwide democratic leviathan that would penalize the aggressive competition, defuse the Hobbesian traps, and eliminate the cultures of honor that hold between the most dangerous perpetrators of violence of all, nation-states. The end of war can result only from the greatest verticalization of power in human history.